Little Tokyo UnBlogged: Ready for Some Serious Pummeling? Ready for Some Serious Pummeling? The 2009 U.S. 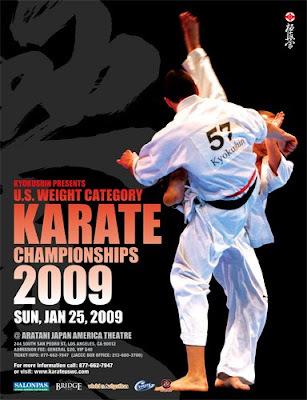 Weight Category Karate Championships are coming to Little Tokyo on Sunday, Jan 25th at the Aratani Japan America Theater. Kyokushin is a type of full contact karate developed by Mas Oyama in the mid-1960’s that calls for no or minimal padding, and is also known as “knockdown karate”…you can pretty much guess the object of the matches. Check out this YouTube video, the kicks can come out of *nowhere*. Now can you imagine the sort of excitement and activity this event would generate in Little Tokyo year-round? So you want some Pinkberry?